Go ahead: look at the camera atop your computer monitor and wonder if somebody is watching you without your knowledge. Go ahead: say something you shouldn’t the next time you’re on your cellphone and think if your audience is larger – and more powerful – than the person on the end of the line. Go ahead: text or post something on a social network and then fool yourself into believing that it will soon be forgotten. Nervous? Scared? You should be – at least in the mind of Oliver Stone, an Oscar-winning director whose controversial films have defined his illustrious career. Perhaps no one has shaped the way the world views the U.S. government than Edward Joseph Snowden, a former National Security Agency and Central Intelligence Agency operative who became the country’s most polarizing whistleblower when he leaked tend of thousands of classified government documents in 2013. Simply titled “Snowden,” Stone’s latest work details how one computer geek who wasn’t strong enough to make it in U.S. Army exposed the government’s global surveillance methods that accessed people’s computers and phones without their knowlege. To some, Snowden’s a hero – a whiz kid who shed light on the government and military’s deep, dark secret. To others, he’s a traitor – a criminal who stole information that was integral to the country’s security. However, all should agree that if there ever was a person who Stone and his conspiracy-filled mind would feature in a movie, it’s Snowden, who has been granted temporary asylum by Russia, where he lives with his American pole-dancing teaching girlfriend, Lindsay Mills. Stone has never shied away from anything controversial, be it “Platoon,” “Born on the Fourth of July,” “Nixon,” “JFK” or “Natural Born Killers.” But Stone’s biggest problem with “Snowden” is he makes the title character – played by Joseph Gordon-Levitt – look like Robin Hood, one who steals from the big bad government in the name of protecting the little guy. The film is a biography of Snowden’s life, opening with his failed attempt to make it in the Army’s Special Forces, which was predictable considering his skinny, wiry body looked like he’d be better suited behind a desk than a bunker. But Snowden’s biggest weapon was his brain, and boy, did he use it. He talked his way into the CIA and promptly became the star student of his CIA mentor, Corbin O’Brian (Rhys Ifans), who teaches the next wave of agents how to use technology to fight terrorism. Snowden finishes at the head of the class and is sent from one country to another to assist in America’s counter-terrorism measures. But he soon learns the methods he helped create to catch the bad guys are being used to spy on completely innocent Americans for the sake of keeping America a global economic powerhouse. 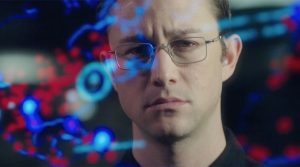 Stone’s biggest strength has always been his masterful character development and the way Snowden transforms from a wide-eyed computer geek eager to help his country to a disgruntled and disenfranchised employee intent on bringing it down keeps the audience engaged throughout the two-plus hour film. The suspense hits a crescendo when Snowden swipes seemingly unstealable documents with the help of a Rubik’s Cube. He makes his way to Hong Kong, where he meets journalists Glenn Greenwald (Zachary Quinto) and Ewen MacAskill (Tom Wilkinson) of London’s The Guardian newspaper, as well as documentary filmmaker Laura Poitras (Melissa Leo) to pull back the curtain on the U.S. government’s clandestine global surveillance tactics. The audience feels the tension and suspense, feeling U.S. soldiers are just seconds away from bursting through Snowden’s hotel door at any moment. “Snowden” does have its shortcomings. His relationship with his free-spirited girlfriend Mills (Shailene Woodley) remains shallow throughout the film, which is strange considering she’s stood by him since they met on an online dating site shortly after he was hired by the CIA. Woodley (“The Fault in Our Stars”) does her best to humanize the emotionless Snowden, but their differences make the audience question why they are together in the first place. However, “Snowden” isn’t meant to be a love story. It’s a thriller about the greatest security breach in U.S. history, one that changed the way Americans look at their smartphones and laptops, which is why “Snowden” is worth watching.